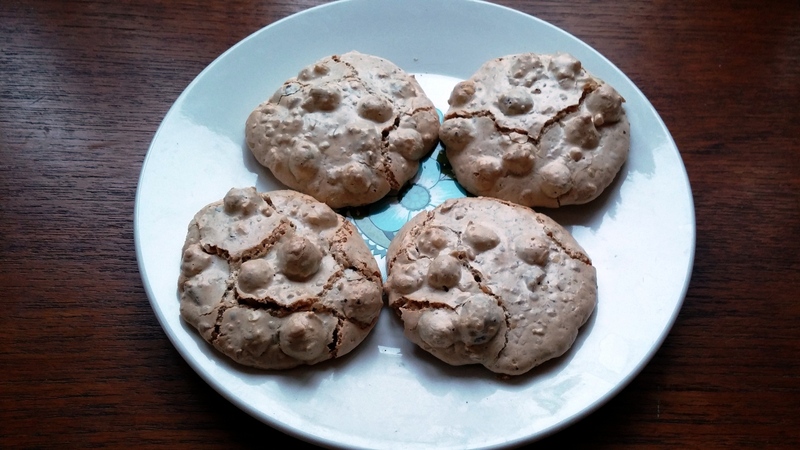 Considering brutti ma buoni – Italian “ugly but good” – cookies are basically just made of nuts, egg white and sugar, methods of making them are surprisingly varied. How much albumen? How much sugar? Grind the nuts? All of them? How fine? Leave some whole? Whisk the egg whites? Cook the mixture in a pan? Include some cocoa? Never mind the question of using almonds. The first recipe I tried was from the American Academy in Rome’s Biscotti book. They were good, but I wasn’t entirely satisfied. It’s taken me this long to get round to trying a different recipe. I thought I’d better try an actual Italian one, direct from an Italian source. One of the biggest, perhaps the biggest, Italian recipe site is Giallo Zafferano (“Yellow Saffron”). When googling Italian recipes you may well get prompted to visit there first. Although I’m gathering other recipes, I thought why not start here? So here’s a tweaked, reduced translation of their recipe. 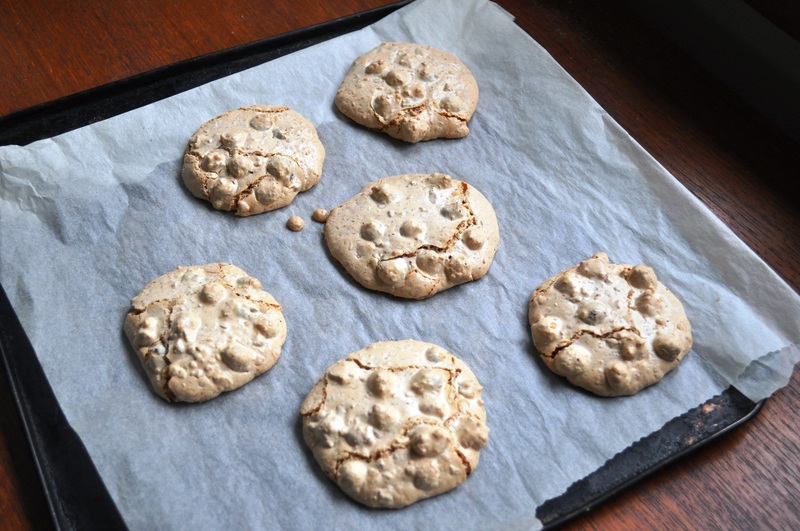 The original makes “about 70” cookies, which seems excessive for domestic consumption – unless you’ve got a very big family that loves hazelnut meringuey things. Even if you don’t speak Italian, it’s worth checking out the site for the pics of the procedure. 1. Gently roast the hazelnuts, at about 150C, until they’re starting to brown. Remnove but keep the oven on. 2. Rub the hazelnuts in a tea towel (which I believe you US lot call a “dish towel”) or cloth to remove the skins. Don’t agonise if a little bit stays stuck. 3. Divide the nuts in two, and coarsely grind half of them in a food processor. 4. In a pan, warm the water and caster sugar until the latter dissolves, then stir in the honey and allow to cool slightly. 5. In a clean bowl, whisk the egg white to peaks. 6. Slowly pour in the syrup, whisking constantly. 7. Keep whisking for another few minutes or so (the original recipe says 10, but this seems excessive), then sieve in the icing sugar. 8. Keep whisking for another few minutes. You’ve basically got a meringue mix. 9. Add the ground nuts, then the remaining, whole, nuts and fold to combine. 10. Line a baking sheet (or two) with parchment, then dollop dessertspoonfuls onto it, leaving space between for the cookies to flow and expand a bit while baking. 11. Bake at 150C for about 12 minutes, until they’ve coloured slightly or as the original puts it, until they’ve achieved “un colore leggermente dorato” (“a lightly golden colour”). Which seems a bit misleading, as egg while plus hazelnut doesn’t really equal golden. It’s more a pale brown. 12. Cool. I actually left mine to cool in the oven, turned off, as you would meringues. The result is very nice, note unlike some hazelnut meringues I remember my mother making on occasion when I was a nipper. I still don’t think this is quite the perfect brutti ma buoni recipe though, so I’ll try another soon, specifically one that uses the technique where the mixture is cooked first before baking, drying it out more. Onwards, bakers! I’m liking this vicarious baking journey!